MouseGlider™, the Patented virtual mouse pad - Patent No. : US 7,997,544 B2. It eliminates the friction caused by the palm and forearm when using a mouse – and it works with ANY mouse! 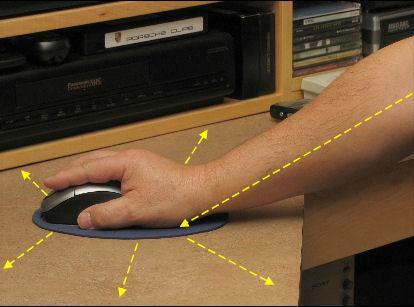 Now your hand and palm glide with your mouse – increasing precision while helping reduce carpal tunnel syndrome, fatigue and eliminating the friction and irritation created by a stationary mouse pad or work surface. • MouseGlider™ Glide-able mousepad - Buy It Now!